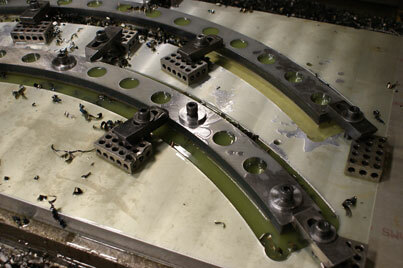 Pace Engineering has CNC capacity on vertical mills to 30” by 60” on three axis parts and forth axis to 18”. The MasterCam programming software enables Pace Engineering to take full advance of the machine tools capabilities. Many of the mills are also equipped with rigid tapping and high-pressure spindle coolant for deep hole drilling. The mills are laid out in mirror three machine cells that allow two employees to operate 6 machines.